Roulette, how does one go about playing this strange looking game? On this page we dive into the game and explain it from the simplest foundation, to the complicated details in a clear way. Follow these few, easy steps and you will be ready to start you exciting journey in the world of roulette. Learn the most important roulette game rules so that you can move on to discover different roulette strategies and systems in order to improve your odds. Before we get into the rules of roulette, it’s important that you grasp foundations of the game. We will therefore start with the different variations of roulette before explaining so that you later understand what these variations entail. The game roulette has been played for many years in casinos, offline as well as online. You can find two different kinds of roulette variations at casinos, of which the rules differ slightly for each type. The main difference between the two types of tables are the zero’s. The American variation has two zero’s (0 and 00), while the European variation sticks to one (0). This means that your changes are higher in winning at European roulette than at American roulette. 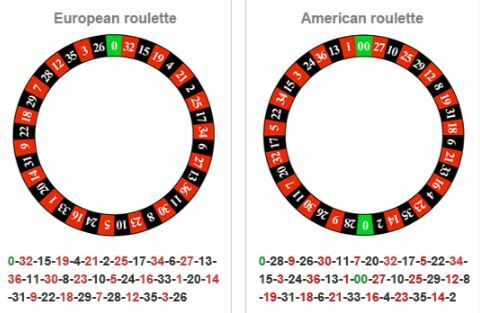 The chances of winning on a specific number bet in European roulette is 2.7 % (1 out of 37), while the American roulette has 2.65% (1 out of 38). In other words, with each 100 euro bet and lost, players at the European roulette tables may lose 2.70 euros, or 5.26 euros at the American roulette table. Roulette is considered a table game, since you stand at the roulette table, similar to card games. This is a large table with numbered spread with different sections for different bets. The roulette wheel is most often found at the head of the table, with separate pockets for all the different numbers on the table. 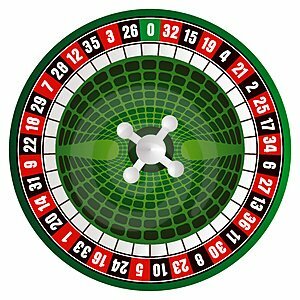 The wheel consists of an inverted cylinder with either 37 of 38 numbers, depending on the type of roulette (American has the 0 and the 00). With the exception of the numbers one through five, no two numbers under 18 and over 18 may lie next to each other on the cylinder. The colours red and black variate throughout the wheel (except for the zeros). Roulette is a rather approachable game that can be played by beginners in the casino, though you are expected to understand the roulette game rules. Below we will discuss the basic principles of the roulette game and the rules with which to play, as well as a short introduction to the different ways to bet. By grasping the main purpose of roulette, you will understand what you are playing for better. This will help you to make the right decisions in regards to bet placement, when to stop, or when to go higher. The basic principle is that you place your bets before the ball is placed in the wheel. You may place bets on the numbers 1 to 37 (or 36), the zero, multiple numbers (for example: four numbers by placing the chip in the corner of four numbers, called a corner), dozens or columns. You can also bet on red or black, or even or uneven or a high or low number ( 1 – 18 or 19 – 36 or 37). Have you made the right bet? Then you will receive the right amount of chips from the croupier depending on what the pay-outs are and how much you bet. Did you bet wrong and lose? Then the croupier will take in all the losing chips and you will be able to place new bets until the croupier says that all bets are closed again. 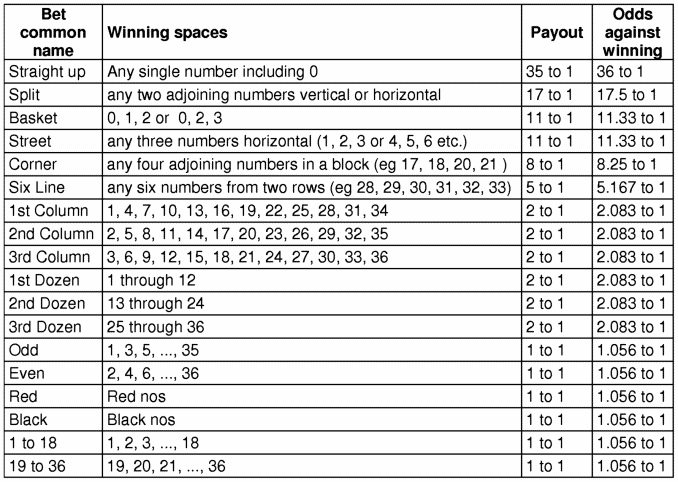 Players can place money bets, in the form of chips, on certain numbers or combinations on the layout (table). The game is guided by a croupier, also called a dealer, who makes sure that the game progresses fairly. Players cannot place bets after the croupier has closed all bets. The croupier starts the round by spinning the ball in the opposite direct of the turning wheel. The wheel and ball will turn slower and slower until the ball falls and remains in a numbered pocket on the wheel. To play at a table in the offline as well as online casino, you will need chips. Cash money is not accepted at casino. An important rule is that the bets must be placed before the croupier says all bets are closed and spins the wheel. If you are too late with placing your bets, then you can join in with the next round. In this case, you will simply have to wait until the ball has fallen, the wins are paid out, and the last round’s chips removed. 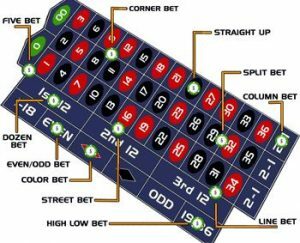 The table below provides an overview of several roulette betting rules and the corresponding pay-outs. While playing roulette, you will discover that you have multiple betting possibilities. You can bet on one single number, or on a combination of numbers. When the ball falls on one of those numbers, than the player wins, but you will earn more on a single number than a combination. The player wins not only the pay-out of that bet, but also the bet amount back, so the bet amount plus the won amount. If the ball does not fall on one of the bet numbers or combinations, then the player loses the bet amount to the croupier.